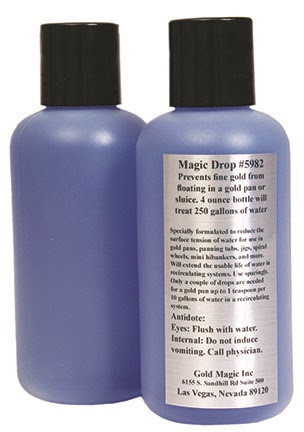 Magic Drops prevent fine gold from floating in a gold pan or sluice. It is specially formulated to reduce the surface tension of water with minimal sudsing. For use in gold pans, panning tubs, jigs, spiral wheels, mini highbankers, and more. Will extend the usable life of water in recirculating systems. A 4 ounce bottle will treat 250 gallons of water. Use sparingly! Only a couple of drops are needed for a gold pan and up to 1 teaspoon per 10 gallons of water in a recirculating system.